Prominent & Leading Manufacturer from Ambala, we offer industrial metallurgical microscope, industrial metallurgical microscopes, fiber testing research industrial microscope, trinocular metallurgical microscopes and weswox 1000x industrial microscope. Blue, Green & Yellow filters, operating manual, guarantee card, and styrofoam molded pack. Co-axial focusing system with large knobs, Pre focusing lever & tension adjustment ring. The Mechanical stage has low positioned co-axial controls on ball bearing guide ways. Co-axial focusing system with large knobs, PRE-FOCUSING LEVER & TENSION ADJUSTMENT RING. Reverse Quadruple nosepiece on ball bearing. The Epi illuminator has 6V-20W halogen lamp with variable brightness control, field diaphragm, aperture diaphragm and polarizer. Yellow, Blue & Green and ground glass filters are available on filter wheel mounted on epi –illuminator. 6V/20W halogen tungsten bulb, operating manual, dust cover , guarantee card and styrofoam molded pack. Our WESWOX microscopes are equivalent or better in quality than Olympus, Leica or Nikon Make. We are an acclaimed name occupied in offering our precious clients a superior quality range of Projection Research Microscopes. Our provided microscope is designed & developed by our experienced professionals utilizing the best grade electrical components & modernized technology as per the international standards. 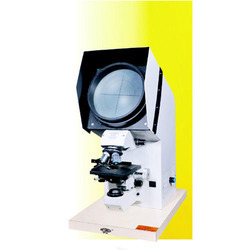 Offered microscope is provided in various specifications according to the needs of customers. 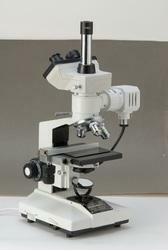 Our customers can avail this microscope from us at nominal rates. (As per 'Metronex' Warszaw "POLLAND" Model MP-3) with 195 mm dia, graduated screen 3600 rotatable, built-in Fresnel Lens and compensating eyepiece. Coaxial built-in Mechanical stage for comfortable & convenient manipulation of specimen slides. Focusing is done by vertical movement of stage, coarse adjustment by rack & pinion and fine movement by screw lever mechanism, driven by graduated knob. Bright fields, knob condenser NA 1.25 with iris Diaphragm and swing out filter holder is provided, which can be operated through a rack pinion knob. Packaging : Complete in a cardboard box. Standard Accessories : The concomitant Accessories - a spare bulb, fuse, vinyl cover & power cord are housed in a drawer on the side wall of the microscope. Packaging Details: This Microscope is packed in a cardboard box. 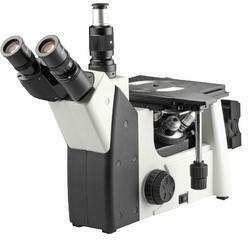 Pioneers in the industry, we are offering a wide range of Trinocular Metallurgical Microscopes. This metallurgical microscope is developed by our highly experienced professionals using latest technology & top quality of electrical components. Offered metallurgical microscope is well tested from our side on numerous parameters so as to deliver a defect free range to customers. 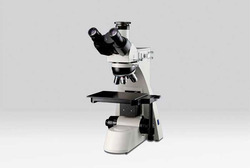 As well, our metallurgical microscope is comes in numerous specifications in accordance with the customer’s choice. With adjustable interpupillary distance and diopeterical focussing arrangement. With adjustable field and aperture Iris diaphragm with slots for dropping coloured filters. Provides excellent bright field in incident illumination of opaque or semi-opaque specimens. Triple revolving nosepiece with positive click stops, Co-axial Focussing System and graduated mechanical stage. Complete with following optics in plywood cabinet day light blue and green Filters & dust cover. Mechanical Body: Single Mold Sturdy Stand with Anti Rust Materials. Extended Base for Better Stability. Diopter Adjustment Ring on Ocular Provides Correction for Eye Acuity. Reverse Angle Quadruple Nosepiece Revolves on Ball Bearing with Positive Indexing. Soft Rubber Knurled Grip on Nose piece. Supported on Ball Bearing Guideways and Having Low Positioned Co-axial Controls for Stage Movement. Analyzer Rotatable 360º. Polarizing & Analyzer Can Be Slided In/ out of the Optical Path. Co-axial Focusing Control with Ball Bearing Guideways & Large Knobs, Pre Focusing Lever & Tension Adjustment Ring. the Slow Motion Has 1 div = 0.002 mm. Aperture Iris Diaphragm and Field Iris Diaphragm 12/30 w Halogen Lamp. Filter Wheel Fixed in Light Path with Blue, Green & Yellow Filter. Dust Cover, Operating Manual, Blue Filter, Styro Foam Molded Pack.